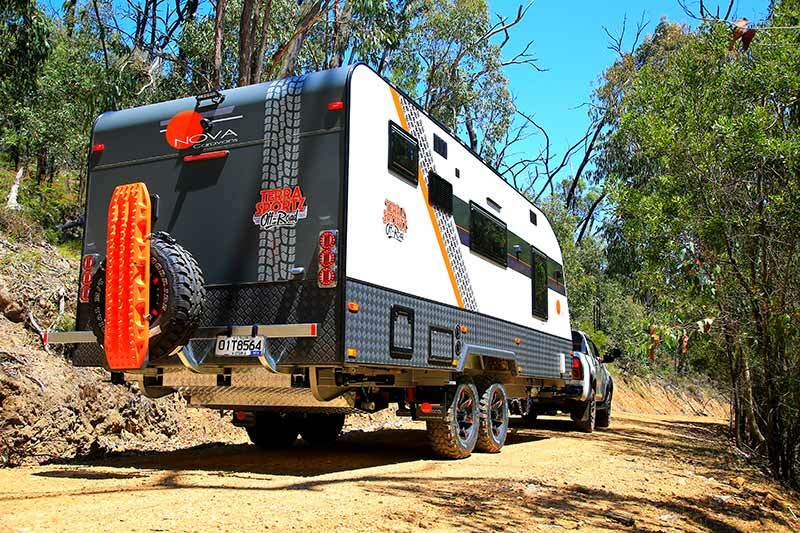 Nova Caravans has updated its offroad van, the Terra Sportz. In 2012, Nova Caravans released its first offroad caravan, taking this writer by surprise. Nova, you see, had long been known as a reputable builder of highway cruisers and I’d assumed at the time that was the way it would stay. Well, the launch of the Terra Sportz showed how much I knew. It initially incorporated Simplicity independent leaf-spring suspension, a front kitchen, front combo bathroom, composite grey aluminium Dibond over a meranti frame, and acres of checkerplate protection underneath. The model has evolved since 2012, with Nova continuing to improve the Terra Sportz according to customer feedback and utilising new equipment that comes to market. The Nova Caravans Terra Sportz comes in a range of sizes, from the Mini Terra Sportz (at 6.87m overall) to a 9.24m Terra Sportz model. Our review van was the tandem-axle 196-1R (8.34m overall). With its new white Nova Pro-Al sandwich panel aluminium sides and matt gunmetal grey front and rear, along with its waist of protective checkerplate, substantial ride height and eye-catching decals, the 2019 Nova Caravans Terra Sportz strikes a purposeful pose on the road. The sandwich-panel walls are said to provide excellent insulation properties, too. Other changes can be found in some of the equipment now being fitted, along with revised internal cabinetry that makes optimal use of the available space. While the van switched to independent trailing arm suspension a number of years ago, it now uses Al-Ko’s Enduro Outback system (rated to 3.7 tonnes), though it is still built on a 6in box-section chassis. Nova has also switched to the 3.5-tonne-rated Al-Ko offroad pin coupling. The underside remains as well-protected as previous versions, especially towards the rear where various components might be more vulnerable to stone-strike. Each 95L water tank is shielded, and even the grey water tank’s PVC outflow is protected (with many vans this is not always the case). If I was being exceptionally picky, I’d say the town water inlet on the offside could be shielded too. Upfront, the van does well on external storage, thanks to a front boot. There’s a checkerplate-fabricated box mounted on the A-frame that also includes a separate compartment for a small generator, with jerry can holders either side. However, the other compartment is taken up by dual 9kg gas cylinders. The A-frame gets a freshwater tap (with stoneguard) and a centre-mounted jockey wheel. The van uses a 12-pin plug, and the reversing camera’s wiring is ready to plug into the vehicle, too. The Terra Sportz is fitted with Al-Ko ESC as standard, too, though it’s powered via an Anderson plug rather than through the 12-pin, which is become more the norm these days. The nearside of the van has a traditional roll-out awning – the perfect spot to relax and watch the 28in Bluetooth-enabled smart flatscreen TV. Just disconnect it from inside and fit it to the swivel arm mounted to the nearside – the TV even has a separate sound bar, which is another new addition for 2019. Towards the rear is another storage compartment, while at the back the van has an external shower and LED light bar (there’s one up front, too). In terms of 12V power, the Terra Sportz is fitted with two 160W solar panels on the roof, a BMPRO DC-DC battery charger, and dual 120Ah deep-cycle batteries, which are fitted inside under the forward dinette seat. Other new pieces of external equipment include a Winegard Sensor HV antenna and decal-matching 16in alloy rims with orange highlights. Overall, the outside of the van presents as a capable, well-finished offroad package. Designed for two people, the layout is comprised of a forward north-south bed, nearside kitchen, an offside leather-upholstered dinette, and a rear bathroom, with the fridge (and microwave above) positioned between the dinette and bathroom. It is quite a familiar layout, true, but it’s done well here. Aesthetically, it is a classy interior – I particularly liked the purple LED strip lighting above the overhead cabinetry. Very modern. One new feature that really stands out in the new Terra Sportz is the cabinetry design, specifically the long drawers in the kitchen and bathroom. They really do add to the amount of storage space. One challenge Nova Caravans had to overcome in order to provide these large drawers was how to accommodate the sink drains and water lines behind the drawers. Well, the solution was to simply build the drawers ‘around’ them, with neatly-finished recesses built into the drawers where necessary. All overhead cabinets are fitted with wide, flat, soft-close doors. There isn’t a great deal of bench space in the kitchen; however, you could use the lid of the four-burner cooktop when it’s not in use. The front bed is surrounded by wardrobes and lockers, though the space at the bottom of the offside wardrobe is marginally taken up by the Truma hot water service. Each wardrobe is fitted with wireless phone chargers, as well as ‘nooks’ for easy access. A couple of 12V and 240V powerpoint can be found in the small cupboard underneath the dinette’s tri-fold table, too, so you can keep power to your laptop, tablet, phone, etc., as you relax with it at the dinette. An RV Wi-Fi unit, allowing you to stream your favourite shows to the telly or your phone, and a double-DIN touchscreen media unit that’s hidden in an overhead cupboard to preserve the modern cupboard design (as well as keeping the lights from the screen out of site), are among the 21st century ‘smarts’ in the Terra Sportz. The rear bathroom includes all of the features you’d expect in a van such as this: a cassette toilet, a washing machine (hidden below the vanity bench with ceramic basin) a large mirror, and a fully-moulded fibreglass nearside shower. The fit and finish throughout is of a high standard; however, being picky, I thought the black silastic used to seal off the hole under the kitchen sink through which a copper pipe runs was unbecoming of a van so otherwise neatly presented. Naturally, there are all the other expected fittings in this van, from the reverse-cycle air-conditioner to skylights, rangehood and more. Now, the Nova Caravans Terra Sportz 196-1R is not a lightweight, though at 2731kg unladen, its weight is comparable to similarly-sized and equipped vans in its class. The good news for owners of Prados and Pajeros, etc., is that there’s a range of Terra Sportz models to suit. With a solid 12V system, a grey water tank, a thoughtful interior and many of those new-for-2019 features, this Terra Sportz should be a faithful companion on offroad adventures.